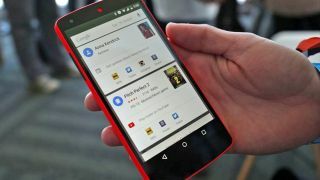 So long, Google Now launcher: the default launcher on Nexus phones and an essential download for anyone looking for the stock Android experience is about to be pulled from the Play Store, according to sources speaking to Android Police. The Now launcher lets you swipe right from the home screen to get straight to your Google Now cards, and the move is another sign of Google switching its focus to the Google Assistant instead - its latest phones come with a revamped launcher called the Pixel launcher, which features the Google Assistant front and center. Right now anyone can download and install the Now launcher, but it doesn't look like that's going to be the case much longer. It's possible the Pixel launcher will then become available to more phones, as it's currently a Pixel-only product. We've already heard rumors that the upcoming LG G6 is going to be the first non-Pixel phone featuring fully fledged Google Assistant capabilities, so the Now launcher's demise may well be timed to coincide with Google Now officially making way for Google Assistant. The tech company hasn't been particularly clear with its branding for Google Now and its various add-ons. Google Assistant looks and feels like version 2.0 of Google Now, although Google hasn't specifically said one is replacing the other. If you want to give the Google Now launcher a whirl, you can still install it, but you might not get updates for much longer. If it came installed on your phone (as on the Nexus devices) it will also continue to work fine, but expect it to be phased out for the Pixel launcher in the near future.